Twenty years on from their million-selling No. UK 1 smash Teletubbies Say Eh-oh!, the fab four are once more eyeing the charts with an irresistibly catchy new album, Big Hugs. Featuring a mix of new songs from the current series of the iconic show alongside a selection of children’s classics with a Tubby twist, the record is available now on digital download and CD. Music and dance are integral to Teletubbies, so what better way to celebrate the 20th anniversary of the groundbreaking preschool show than with a brand new album for youngsters to sing and dance along with. 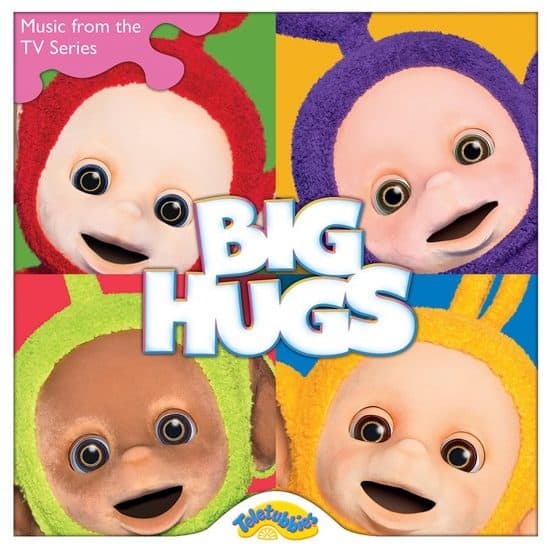 Narrator Daniel Rigby lends his vocals to many of the songs, including the title track Big Hugs, the popular Bottom Bump Song and Tiddlytubbies Songtime, which introduces the world to the delightful Tiddlytubbies. In addition to music from the first two series of the revamped Teletubbies, the 19-song soundtrack features timeless favourites that kids know and love performed by the voice of the Tiddlytubbies and Voice Trumpet, Teresa Gallagher. Preschoolers will be moving and grooving to children’s classics such as Wheels on the Bus, Four in a Bed and Head, Shoulders, Knees and Toes. Teletubbies Theme; Big Hugs; Tubby Car Song; Head, Shoulders, Knees and Toes; Tubby Packing Dance; Tiddlytubbies Songtime; Bottom Bump Song; Tubby Phone Dance; Tiddlytubbies Playtime; Four Little Monkeys; Puddle Dance; If You’re Happy and You Know It; Party Dance; The Custard Ride; Stomp Dance; Wheels on the Bus; Old MacDonald Had a Farm; Five in the Bed; and Tiddlytubbies Sleepybyes. This CD will have you bopping away to the theme tune in no time! We have been playing through the TV while tidying up and it really gets you motivated. I love the inclusion of old favourites such as Old Macdonald Had a Farm and Wheels on the bus. Baby girl is fascinated with the theme tune! It brings back memories to me as the Teletubbies used to be what my younger brother used to watch when he was small. It’s perfect for listening in the car as well, getting everyone to sing along for the journey. *We were sent a copy of Teletubbies Big Hugs CD in exchange for this post. All thoughts are my own. This post contains an affiliate link.